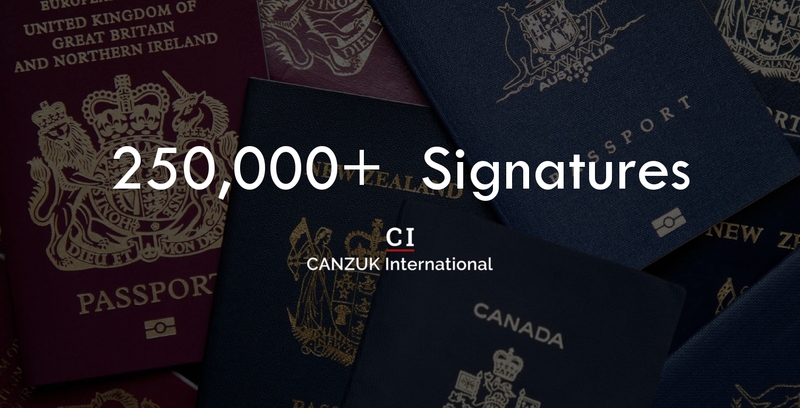 CANZUK International’s online petition, advocating free movement of citizens between Canada, Australia, New Zealand and the United Kingdom, has received over a quarter of a million signatures (and is continuing to rise). Support for freedom of movement between the CANZUK countries is growing rapidly every day, and members of the public – as well as high-profile politicians and diplomats – are pledging their support for visa free/work permit free travel for citizens between Canada, Australia, New Zealand and the United Kingdom. Our petition is also one of the most viewed petitions of all time on Change.org, as thousands of people have signed and shared online, demonstrating huge support for our proposals and promoting the campaign as one of the fastest growing issues within international politics. The campaign is making tremendous progress, and we are determined to continue increasing our awareness so free movement will be adopted as official immigration policy of Canada, Australia, New Zealand and the United Kingdom. Sign and share our online petition – with over 250,000 signatures, our petition is being viewed daily by politicians, diplomats and government officials across the world. The more signatures we receive, the more we demonstrate global support for our initiative, providing a mandate for our respective governments to adopt free movement as official immigration policy. To sign our online petition, please click here. Donate – we rely solely on financial donations from the general public to ensure that free movement between Canada, Australia, New Zealand and the United Kingdom is recognised and discussed among MPs, senior government officials and diplomats. Please help us continue our campaign by donating today. Contact your local MP – change within our parliaments begins with parliamentary members drafting Bills and promoting causes which the public support. By writing to your local MP, you are asking them to represent your voice in parliament and advocate CANZUK free movement within their respective national governments. For details about contacting your local Member of Parliament, please click here. We sincerely appreciate all support and efforts made in promoting freedom of movement between Canada, Australia, New Zealand and the United Kingdom, and with your help, CANZUK International will continue to advocate, and achieve, free movement policies between these four countries.